Creating a library space that students want to visit means understanding the different ways students actively engage with learning both individually and socially. Modular tables and mobile bookcases give freedom to reconfigure spaces quickly and easily as groups, individuals and classes flow in and out through the day. Our colourful bookshelves can be used to create zoned learning spaces for individual and group activities, while contemporary seating brings sophistication and comfort. IT can be integrated throughout the space with options for both desktop and freestanding power access for fixed and plug-in equipment. Contact us to discuss how we can design a flexible Learning Commons layout to fit your space and meet your specific priorities. We also offer a Primary School Library Design service. Our designs are based on research on how students move through spaces and what tempts them to read a digital message or pick up a book. Physical factors of space and colour directly affect learning experiences so we take the time to get this right. Contact us to discuss how we can design a flexible Learning Commons layout to fit your space and meet your specific priorities. The varying demands of students and staff mean that the Learning Commons has to be simultaneously a haven for quiet study, a space for small groups to collaborate, and big enough to accommodate whole classes. Different areas can also be customised to appeal to different age groups – Year 7s or a special 6th form area, for example. Tables can be joined together for large group teaching or for a staff or governors’ meeting. As well as students moving seats and desks to suit their own preferences, the whole layout can be completely changed to refresh, for example, at the beginning of a new term. Click on the example layouts to see how the same furniture can be easily moved to offer a wide range of learning spaces. Cleverly designed, a space of 250 square metres can easily accommodate seating for 72 students as well as plenty of books on show. Tables can be joined together for large group teaching and will also seat 16 for a staff or governors’ meeting. Click on the arrows to see the same furniture used in 4 different configurations. 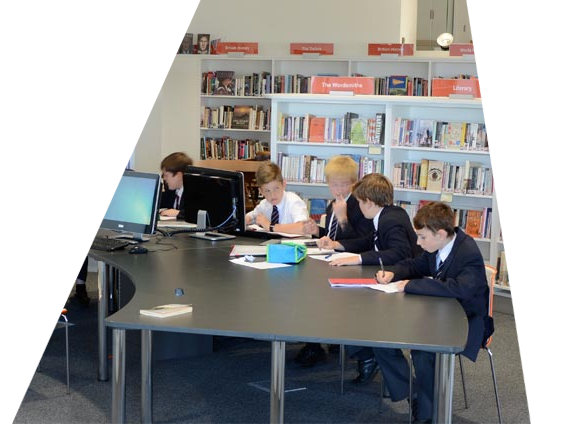 A space of 150 square metres can easily accommodate seating for 46 students as well as plenty of books on show. Tables can be joined together for large group teaching and will also seat 16 for a staff or governors’ meeting.